The comments from rural commentators are hot, and one in particular deserves attention: the rural driver who has a Prius. This is one of the lesser known concerns around VMT taxes or general highway tolls: there is no incentive towards fuel economy. One reason why VMT charges are on the table is institutional worry that hybrids and alternative fuels will take a bite out of gas tax revenues. Just so, VMT taxes or general tolls do not encourage drivers to save fuel per se. The black area of the bar charts shows the amount of Federal gas tax paid for a 40-km trip with the different fuel economies associated with the two vehicles. The Federal tax does not vary by state, so the Accord and Silverado drivers pay the same amount for Federal taxes in each state, though the Silverado driver pays more than the Accord driver. 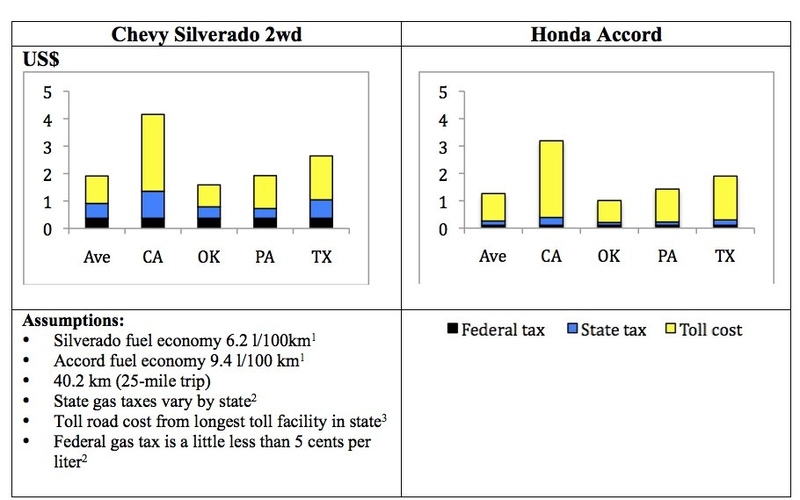 One of the key points in the exhibit concerns the difference in state gas taxes and tolls.Tolls (the yellow) are a costly part of the 40-km trip, but a comparison between Oklahoma and California shows the difference that baseline tax and toll conditions can make on what drivers ultimately pay. In Oklahoma, state gas taxes are low—about a nickel per liter—whereas the average for all 50 states is about 7 cents per liter. California gas taxes are high, and Californians also pay sales tax on gasoline, so that the American Petroleum Institute estimates that gas taxes run roughly 13 cents per liter. California has few highway tolls: it has five tolled highways which account for about 120 miles of the state system. Most Silverado drivers in California pay just the state and Federal gas taxes—the blue and black, which amount to $1.35 in taxes for the 40 km trip, unless they are on one of the few tolled facilities. Oklahoma has many tolled highway facilities; it has 10 different turnpikes with just under 1,000 centerline miles. Off those tolled facilities, Oklahoma Silverado drivers only pay about 80 cents in taxes for the same 40 km trip for which California Silverado drivers pay about $1.35 in taxes. On tolled facilities in Oklahoma, drivers pay about $1.45 for the trip. Thus Oklahoma uses tolls rather than gas taxes, whereas California relies on gas taxes rather than tolls. But the tax and toll bills for both states fall within a dime of each other, though their finance mechanisms vary quite a bit. 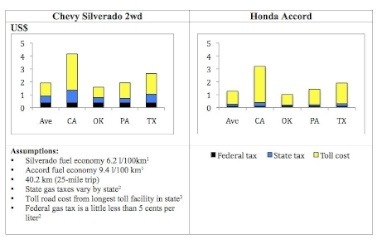 The comparison also shows what happens if you add a toll to a state where the taxes are already relatively high: those Silverado drivers on tolled facilities in California pay a lot more than those subject to tolls in Oklahoma. Comparing the Silverado and the Accord drivers allows us to see the different driver incentives built in to highway tolls versus gas taxes. The Accord driver saves a lot of money in Federal and state gas taxes in California. What costs the California Silverado drivers $1.35 in taxes only costs the Accord driver about $0.40. This driver saves on the total fuel bill and saves nearly 30 percent in taxes. 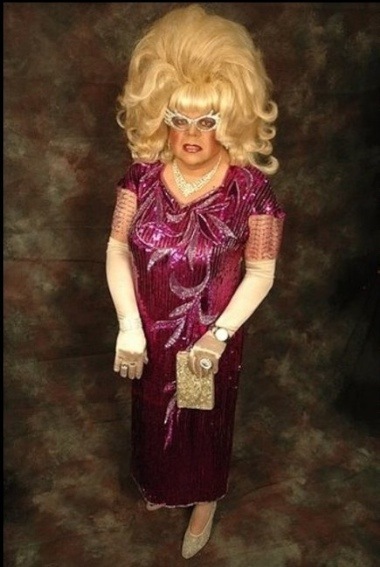 Thisis where it gets interesting. The Accord driver in Oklahoma, with its reliance on tolls rather than gas taxes, pays about 21 cents when the Silverado driverspay 80 cents, saving a little less than 27 percent on taxes in Oklahoma. This 27 percent is compared to the 30 percent savings in California. Highway tollsdo not reward fuel efficiency the way gas taxes do, and thus drivers face different incentives for fuel economy in different places.